I’m putting out another donation call to help the Oaxaca earthquake victims. The situation is dire along Oaxaca’s southern coast and particularly in the city of Juchitan de Zaragoza. There are two ways to donate that I know your gifts will go directly to the people in need. They are trusted to know where the funds can be used. Francisco Toledo is a renown Oaxaca artist-activist who was born and raised in the Isthmus of Tehuantepec, that suffered the most severed earthquake damage. Denise Lechner is a personal friend who has worked with artisan communities along the coast of Oaxaca for years. Go to her Facebook page to see photos of the affected areas. Our hotel in Puerto has been one of the gathering places for donations: Denise Lechner has been on top of encouraging donations, and then driving them to the Isthmus of Tehuantepec. We too have donated, both in money and in supplies, and will do more. So much damage! 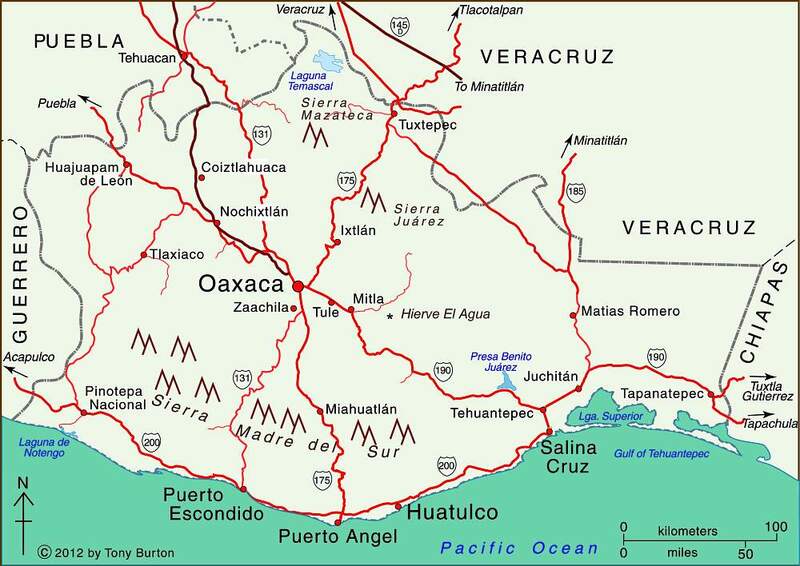 In Tehuantepec, Chiapa de Corzo, up in Mixe country….but Juchitan de Zaragoza is a disaster zone. I encourage everyone that can give anything, to do so. Please. Friends, if everyone who reads this sends something ( 5$/ 20$/ more if you can afford it), it would make a huge difference. Some places have even lost access to water, as wells have collapsed or been buried by rubble. This is the largest earthquake to hit Mexico in 100 years…please help if you possibly can. The news of the extent of the damage of this earthquake is overshadowed by the drama of the terrible hurricanes … but Mexico needs help. Something on the order of 1,000 houses have been damaged in Juchitan, along with public buildings. Bad damage ( and slow help ), with many houses down, in San Mateo del Mar (an important weaving village on the coast — near Laguna Superior on the map). I have not yet heard from San Francisco del Mar. Houses rendered uninhabitable in Tehuantepec; I don’t know how many because it is still hard to get through to anyone, but we were able to talk to one friend. Her wonderful old house is probably beyond repair and she says others, too. Power out/ many ( but not all) phones out. Chiapa de Corzo, the wonderful old fountain from the 1500’s, and some houses; again, I don’t know how much. We sent supplies with Denise and now we are going to send money so she can buy what she sees is needed. You can tell your people to have full confidence in Denise..I certainly do. It was a huge long quake, and there have been so many aftershocks, off Chiapas and off Salina Cruz. Thank you for putting the information out there, Norma! This entry was posted in Cultural Commentary and tagged donation, earthquake, gifts, Isthmus of Tehuantepec, Juchitan, Mexico, Oaxaca, support. Bookmark the permalink. Norma’s post and this article in the New York Times brought me to tears. Of course it spurred me to send a donation to Denise. I will send another donation to the foundation in a few days. Heartbreaking! Lynn, you are a dear. Thank you SO MUCH. Is there a US address of services (other than RED CROSS) where I can send a donation for the earthquake in Mexico? Anyone who wants to send a check to me for a donation? Please send me an email and I’ll send you a mailing address. Thank you for your updates Norma and everything you do for my Mexico. Just sent donation through the Fco. Toledo Foundation. Thank you so much Juanita. Big hugs. Fundación Comunitaria Oaxaca – the Oaxaca Community Foundation has created a special fund to assist with continuous aid efforts in the Istmo, promising to coordinate with civil society and government. Ser Mixe – an NGO supporting relief efforts in the Mixe region. Indigenous Professionals Association for Support, Defense, and Translation – an NGO that works in human rights in indigenous communities. Sent donation to Francisco Toledo FOundation yesterday. Thank you for getting the word out. Norma-thank you for this assistance with contributions. Sent money to Denise and I do appreciate all you do for our friends in Mexico. Cindy, big hugs and thanks. Money sent to Denise. Much appreciation for people working and helping in hard-hit areas. Bless you Jill for your generosity. Done and done and will most likely do again. Thank you Norma. I really appreciate you and your connections! Thank YOU, Susie, for responding to the call consistently! Mwah. Friends, if everyone who reads this sent some money ( 5$/ 20$/ more if you can afford it), it would make a huge difference. Some places have even lost access to water, as wells have collapsed or been buried by rubble. This is the largest earthquake to hit Mexico in 100 years…please help if you possibly can.